In Gandhinagar: 27th January 2017, Friday, 8:45 pm onwards at Town Hall, Gandhinagar. In Ahmedabad: 5th February 2017, Sunday, 8:45 pm onwards at H.K. Hall, Ashram Road, Ahmedabad. The show contains a special one hour solo act by Amit Khuva about Evolution of Comedy in Gujarat from 1750 to 2017. 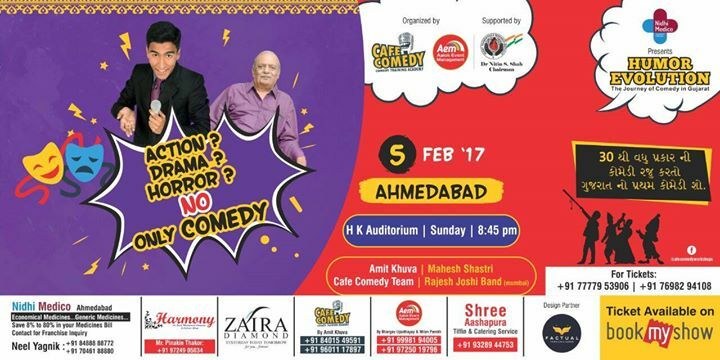 This show will be benefited to Gujarati Humor Industry to get enlarged in terms of concept of clean comedy and for fund raising event for Haemophilia affected and disabled peoples. ચાલો સાથે મળીને હાસ્ય ના અાનંદ ઉત્સવની ઉજવણી કરીએ . . . . .